Vitamin B12 plays an important role in the functioning of a healthy body. It is essential to the production of red blood cells that carry oxygen through the body’s tissue, including a healthy nervous system. Two groups of individuals that are most prone to Vitamin B12 deficiency are the elderly and vegans. The ability of older adults to absorb and digest water soluble vitamins (like Vitamin B12) decreases with age, and the diet of vegans lacks B12 found in animal meat. Common Vitamin B12 deficiency is pernicious anemia, which is caused by poor Vitamin B12 absorption – when the stomach makes less of the substance the body needs to properly absorb vitamin B12. 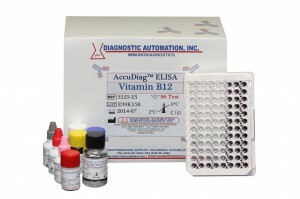 Vitamin B12 ELISA kits have been shown to be the best assay in measuring B12 in serum. Vitamin B12 ELISA kits are delayed competitive enzyme immunoassays for the in vitro quantitative detection of vitamin B12 in human serum or plasma. Categorized as Anemia ELISA kits, these Vitamin B12 ELISA tests have high sensitivity and excellent specificity for detection of human Vitamin B12 in serum. The sensitivity of the Vitamin B12 ELISA kit is 70.13 pg/ml. Vitamin B12 ELISA kits are user-friendly, simple, and safe. Results are quick, reliable, and easy to read. Total time for test procedure is approximately 95 minutes. For more information on the Vitamin B12 ELISA kit, click [here]. Another ANEMIA ELISA kit is one that detects Iron deficiency. 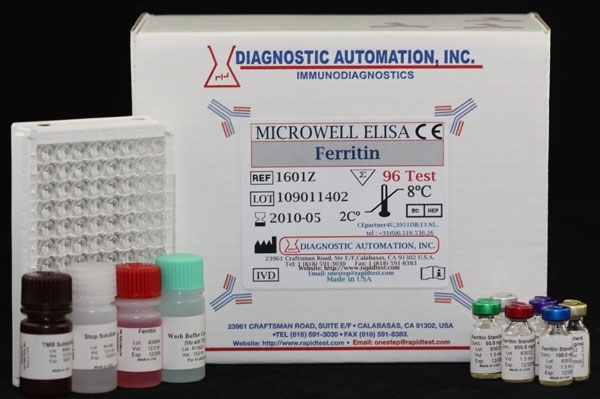 The Ferritin ELISA Kit is an enzyme-linked immunosorbent assay for the quantitative determination of ferritin in human serum. The Ferritin ELISA kit, like other ELISA kits, is for in-vitro diagnostic use only. The sensitivity of the Ferritin ELISA kit is 5.0 ng/ml and the specificity is 98.7%. Click [here] for Ferritin ELISA kit product details. Other related ELISA kits are Vitamin B12 ELISA kits (in Food) which are enzyme immunoassays for the quantitative determination of Vitamin B12 in Food. The sensitivity is 0.3 ng/ml and the specificity is 98%. Click [here] for product details. Product information on the Vitamin B12 ELISA Kits, Ferritin ELISA kits, or any other ELISA Kits, can be obtained from our main website product page [click here]. LosAngeles-based Diagnostic Automation/Cortez Diagnostics, Inc. prides itself on offering simple, convenient, and inexpensive ELISA Kits worldwide. 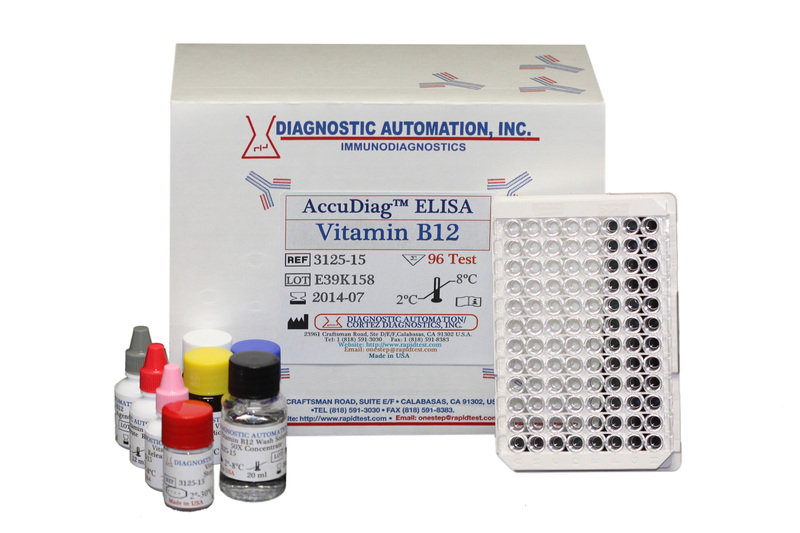 For more information on these ELISA Kits, or any other diagnostic medical testing equipment, including Rapid Tests, IFA Kits, CLIA test kits, Serology, and Instrumentation, please contact our Customer Service Representatives at 818-591-3030. Iron deficiency is one of the most common nutritional disorders today, and at its most extreme, this iron deficiency can develop into iron deficiency anemia. Anemia usually occurs when a lower than normal number of red blood cells is present, or if the red blood cells do not contain enough hemoglobin. Iron builds strong red blood cells, and Ferritin is one of the body’s primary iron-storage proteins. Thus, measuring ferritin in serum is useful in understanding iron deficiency, or in some cases, an abundance of iron. This increase in iron generally appears in patients who have regular blood transfusions, or have a predisposed genetic disorder. Ferritin ELISA Kits are perfect testing methods for determining the amount of Ferritin concentration in human serum. Ferritin ELISA Kits are rapid, sensitive, and reliable. The antibodies developed for the Ferritin ELISA Kits can determine a minimum concentration of human ferritin of 5 ng/ml. The Ferritin ELISA Kits are also important for laboratory monitoring of the iron levels of pregnant women, blood donors, and renal dialysis patients. Ferritin ELISA Kits are based on a solid phase enzyme-linked immunosorbent assay. Ferritin ELISA kits utilize one anti-ferritin antibody for solid phase immobilization, and another mouse monoclonal anti-ferritin antibody in the antibody-enzyme conjugate solution. The Ferritin ELISA Kit sample is allowed to react simultaneously with the antibodies, resulting in the ferritin molecules being sandwiched between the solid phase and enzyme-linked antibodies. Ferritin ELISA Kits have a Sensitivity of 5.0ng/ml and a Specificity of 98.7%. Total time to obtain results of Ferritin ELISA kits, is approximately 80 minutes. For more information on Ferritin ELISA Kits or any other ELISA Kits, please refer to our main website page [click here]. Los-Angeles based Diagnostic Automation/Cortez Diagnostics, Inc. prides itself on offering simple, convenient, and inexpensive ELISA Kits worldwide. For further information on these ELISA Kits, or any other diagnostic medical testing equipment, including Rapid Tests, IFA Kits, CLIA test kits, Serology, and Instrumentation, please contact our Customer Service Representatives at 818-591-3030.